Lets check out how we can implement Overriding in ABAP Objects. This is also known as the Redefinition of the method. Overriding is useful, when we want to extend the functionality of the inherited method. For example: we have a generic class of CAR and it has method DRIVE. We derived a subclass, say COROLLA, from that class. Now, we need to change the functionality in DRIVE method of the subclass COROLLA. In this situation we can “Redefine” the method DRIVE. This redefinition of the method is called Overriding. In ABAP, we have extension REDEFINTION of keyword METHODS to be able to implement the Overriding functionality. WRITE: / 'You are driving a Car'. WRITE: / 'Your car has BLUE color'. 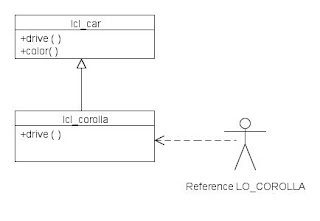 CLASS lcl_corolla DEFINITION INHERITING FROM lcl_car. * Here we are overriding the functionality of the drive method. / 'Do you like it?'. DATA: lo_corolla TYPE REF TO lcl_corolla.